The world is becoming more urban. Right now, 54% of the world's population live in cities, but by 2050, that's expected to rise to 66%. To deal with this huge influx of people, we're going to have to rethink our cities' transport links, communal spaces, environmental methods and how they manage the flow of people. Thankfully, a number of technologies are here to help. 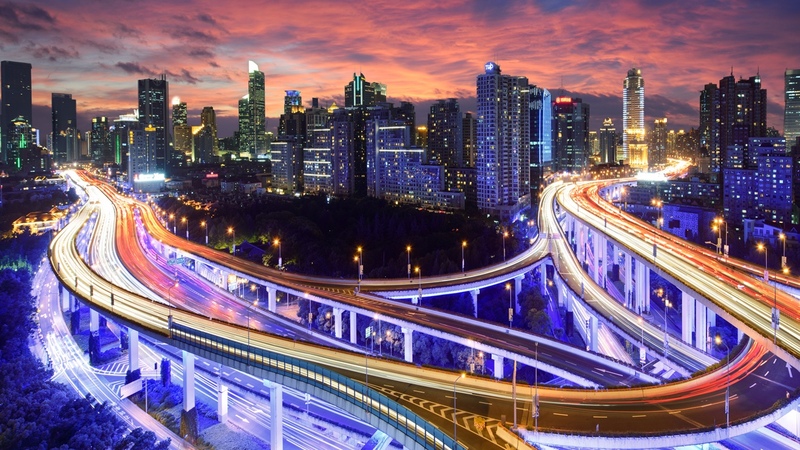 Converging technologies have led to the rise of the smart city. These implement digital, information and communication technologies to transform urban areas into greener, more cost-efficient, and generally more pleasant places to be. With more and more connected devices – including wearables and smartphones – more of us can interact with the digital architecture of where we live. Think of it as the internet of things, but instead of your toaster talking to your fridge, it's on a city-wide scale. What's more, wearables have a huge part to play. Some US states are already experimenting with how to integrate them into their smart cities. The state of Utah, for example, piloted Google Glass with a transit-tracking mobile app, so the wearer would receive a notification for an approaching train or bus. They could also view information about the route, and track the vehicles in real time. Other cities have experimented with body-worn cameras to document police-officer-to-citizen interactions. The hope is this will reduce citizen complaints and frivolous lawsuits. A Gartner report titled How to Begin Integrating Wearable Devices Into Smart City Governments recommends including wearables in multichannel integration architectures – in other words, making sure they are present in as many different areas of life as possible. This is in order to avoid making agency-specific wearable "silos", whereby some areas – transport, shopping etc – are fully equipped for those with wearable devices, while others – education, for example – aren't. Though the increasing popularity of wearable devices should also help with this. But there's more to smart cities than just greater connectivity. The very buildings themselves can be more dynamic, interactive structures. The National Institute of Building Sciences identifies three types: living, regenerative and adaptive buildings. Living buildings are powered by the natural environment – so harness rainwater and the energy from wind and sunlight. Regenerative go a step further and also improve the surrounding environment; they produce more energy than they consume and share it with other buildings nearby. Adaptive buildings, meanwhile, adapt to changing needs and conditions like climate change; they make renovation or repurposing of space easier, less expensive and less burdensome on the environment. But that's just the start. A project called ExoBuilding, from the University of Nottingham, is a tent-like structure that reads the inhabitants' physiological data from a wearable device. It then changes its height, volume and shape accordingly. If you need to relax, it can be set to pulse slowly, mimicking deep breaths. Need more energy? Speed it up. This might all sound a bit pie in the sky, but inroads are already being made. The London Underground is kitted out with sensors made by Telent Technologies – and aided by Microsoft's Azure cloud platform – to monitor system degradation, temperature, vibrations and humidity, and to show warnings and alerts. London is moving with the times above ground too. It recently started trialling a new traffic light system that detects when a lot of cyclists are approaching and stays green longer to aid traffic flow. The idea is to reduce congestion during the busiest times of the day. Of course, this could be unnecessary if Foster + Partners SkyCycle is ever made. It's a network of cycle lanes that would run above London's train lines, effectively giving cyclists their own roads. Not only would this ease congestion on the streets of the capital, it would also be much safer for cyclists. But London isn't alone in joining the smart city revolution. Glasgow has spent £24 million installing street lights that brighten for pedestrians and cyclists, and traffic-tracking sensors in roads. Bristol is collecting data on health and pollution and interpreting it using a 'city operating system'. Further afield, things step up a gear. Songdo in South Korea was built from scratch, and is touted as the world's first smart city. Sensors monitor everything from temperature, energy use and traffic flow, while household waste is sucked straight from the kitchen through a network of underground tunnels to waste processing centres. You won't see a single rubbish truck on its streets. In order to effectively police and manage the 2016 Olympic Games, the city of Rio de Janeiro has set up a Bond villain-style command centre called Centro deo Operacoes Preifetura do Rio de Janeiro (or COR for short). It monitors everything from the weather, live CCTV video feeds and traffic flow. No wonder it's been dubbed the "quintessential smart city project". Expect the trend to continue. Last year, India's prime minister Narendra Modi pledged to build 100 smart cities across the country. There is a downside to filling our cities with this kind of tech. All this monitoring creates a huge amount of data, and wherever there's data, there's money to be made by big companies. Critics warn that smart cities could become an 'Uncanny Valley' – that is, if they fail to deliver on their promises, or do so without consulting their citizens, they could alienate the very people they are trying to engage. The problem is that smart cities don't enable individual access to data; rather, the citizens merely produce the data which the city then uses in all sorts of ways, some of them without the citizens' knowledge. There's a danger that people will feel like they're being used. When you consider the marketing possibilities, that's hardly surprising. With all of us creating data about where we go when, what we eat at what times and what we're interested in, marketers can bombard us with highly targeted adverts at just the right moment. Eating a packet of salty peanuts? Maybe you could do with a beer to wash them down. Stressed? The marketers will know thanks to your increased heart rate, and could suggest some fatty foods that might cheer you up. You might think they would never be so unscrupulous. But a couple of years ago saw a controversy surrounding Wi-Fi bins. It turned out that a series of bins in London's Cheapside were tracking passersby by identifying their smartphones' Wi-Fi connections. They tracked which shops people went to and how long they stayed. The aim was to display targeted adverts on the side of said bins. For example, if one coffee chain saw a previously loyal customer was now going to a rival for her morning pick-me-up, it could remind her of a special offer as she passed the bin. That's not the only creepy use of tech. Smart billboards can recognise a Mini and say hello to it, while i-DAT's Qualia facial recognition system can detect when you're smiling. Imagine what would happen if a dictatorship got hold of this tech. Not enjoying the official government broadcast? Bad citizen, you. And this is before we consider the potential for chaos. When your city has an operating system, hackers will be lining up to crack it. They could tap into the transport infrastructure, air traffic control, lights and heating systems of every building in the city… we could see the kind of carnage usually reserved for Hollywood blockbusters. As with any technology, there's the potential for misuse. As long as the right safeguards are put in place, smart cities could bring untold economic, environmental and health benefits to their denizens. They could also be a lot of fun. Pan Studios' project A Fork in the Road used the road layout of the city of Indianapolis as the template for a choose-your-own adventure storybook. Each road represented a new forking storyline. Crowdmemo, meanwhile, encourages people to make mini documentaries about important public spaces in their towns. They then put a QR code in the space in question that links to the video in the cloud for anyone to watch. There are plenty of hurdles to overcome. But who knows, smart cities could help us regain our sense of community. It could turn out to be the biggest benefit of all.